Last November, I relocated to Austin temporarily when my employer moved operations there from San Antonio. 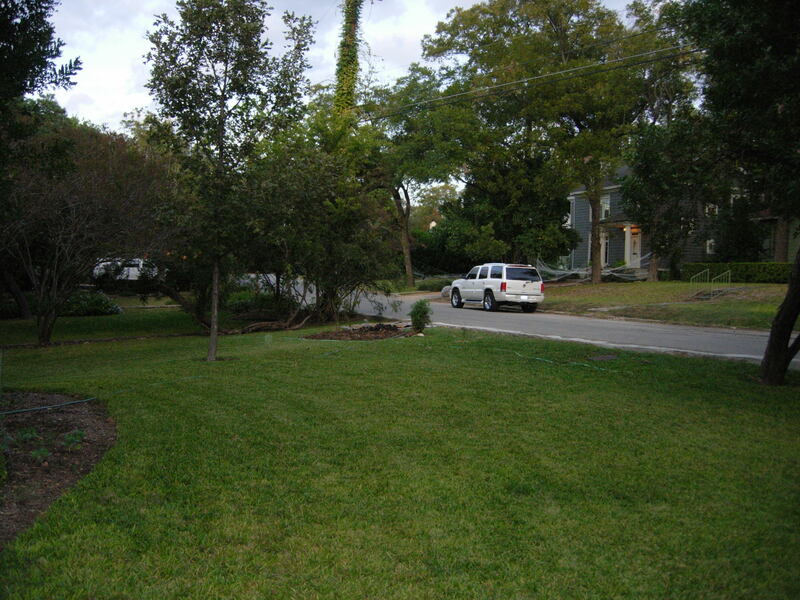 Since my husband and I had just sold our family home in San Antonio’s Alamo Heights (78209), I decided to take an apartment in Austin’s Travis Heights neighborhood (78704) while continuing my job and figuring out next steps. Treating the episode as a “semester abroad” with a full-time paycheck seemed a logical approach for our family, as was avoiding the maddening 75-mile commute. That’s how I ended up renting Apartment B in a small South Austin quadriplex. 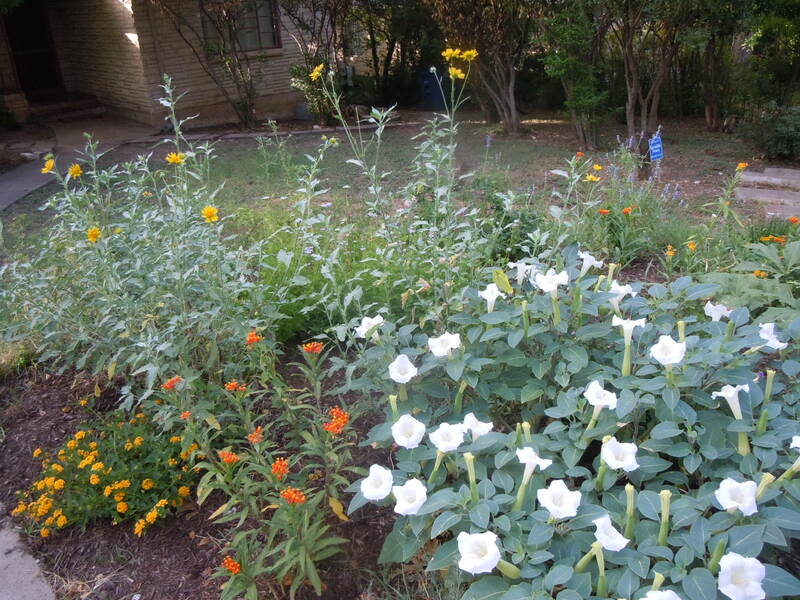 Exploring, experiencing and enjoying Austin’s myriad offerings held immense appeal, but one thought plagued me: I MUST have a garden, or grumpiness would trounce my fun. 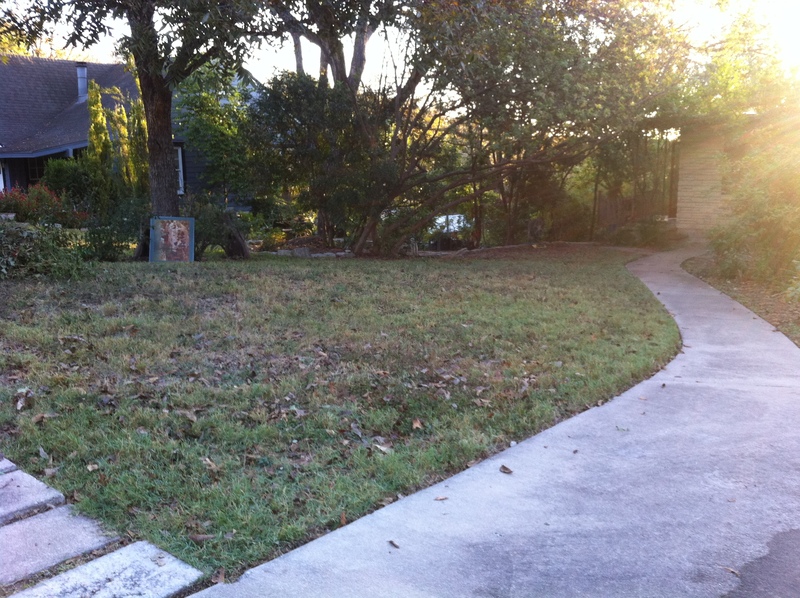 With my lease starting December 1, 2010, I begged my landlord to allow me two weeks’ early access so I could begin a turf-to-bed conversion that would turn the Bermuda grass infested yard into a stage for my future butterfly garden. My new circumstances required I park on the street and enter my apartment via the walkway above. A garden makeover would not only provide a steady supply of caterpillars and butterflies to keep me busy, but a more scenic stroll each time I left the house. Since first freezes in Austin can occur as early as November 15, I raced to begin my project, hoping to exploit the season’s remaining warm days. But just as I arrived in Austin, the days grew shorter and temperatures dropped. What to do? Solarization flaunts a low cost, low tech, low impact, chemical free approach to weed removal and bed prep. Plus, why not take advantage of the free solar power that shines on our part of the world an average 300 days a year? The idea of solarizing the soil or killing turf in this manner is to smother, almost pasteurize the soil, killing most weeds and undesirable live organisms by raising the temperature and “cooking” the earth–much like a compost pile. 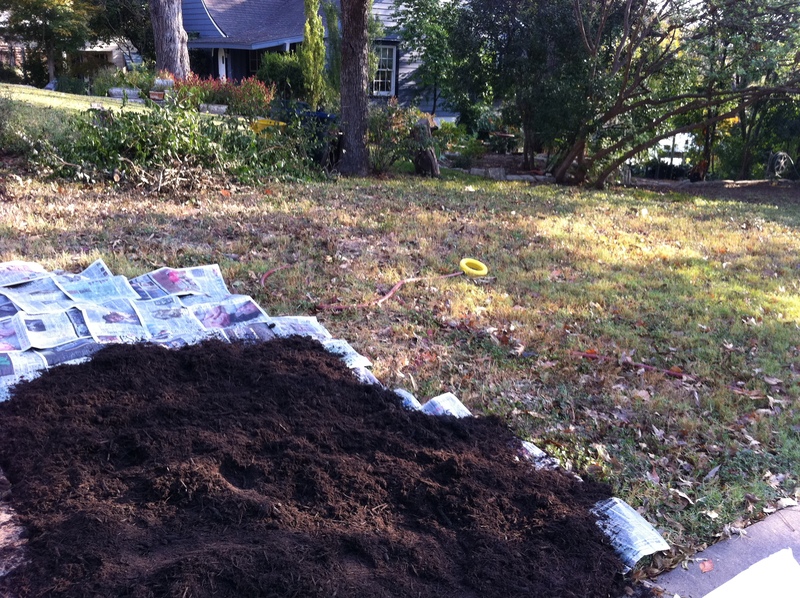 Piling mulch on top of layers of newsprint ensures darkness and insulates the ground, increasing the temperature–as high as 140 degrees, depending on the time of year you do it. According to several studies, solarization kills pathogens, nematodes, weed seeds and seedlings and speeds up the breakdown of organic material, resulting in more soluble nutrients for future plants. The process can take as little as three – six weeks. With so many drought damaged landscapes in Central and South Texas, maybe it’s time to think about solarization and converting your yard to a butterfly garden. Here’s how to do it. 1. 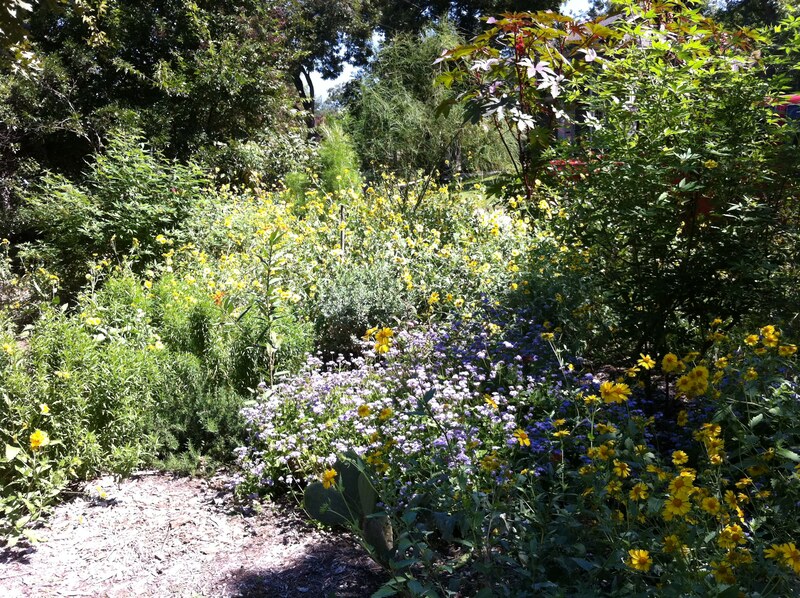 Thoroughly water (but don’t soak) the area you’re planning to convert from grass or weeds to butterfly beds. 2. Take a pile of newsprint destined for the recycling heap (I prefer the Wall Street Journal because they still publish their pages in large format), and lay down six, preferably 10 layers of newspaper over the well-watered turf. Cardboard, feedbags, and other compostable paper products can also be used, but my preference is newsprint. NOTE: Many solarization directions call for black plastic to turn up the heat on the soil. You can use plastic, but then you will have to remove it later. As a lazy gardener, I prefer materials that will simply decompose. 3. Water down the newsprint with a good spraying so it doesn’t argue with the breeze and will stay in its assigned place. 4. Load 4-6 inches of native Texas mulch (for the two 15 x 10 areas straddling my walkway, I used about 40 bags/or $90 at the South Austin Home Depot) on top of the newspapers. Then? 5. Water again thoroughly and wait. You can begin to install transplants immediately, but that’s another blogpost. Next week: we’ll discuss transplanting your favorite butterfly plants and getting seedlings started and incorporating edible landscape into your butterfly garden.